For those of you who have read my blog for some time, you know how much value I place on cooking. 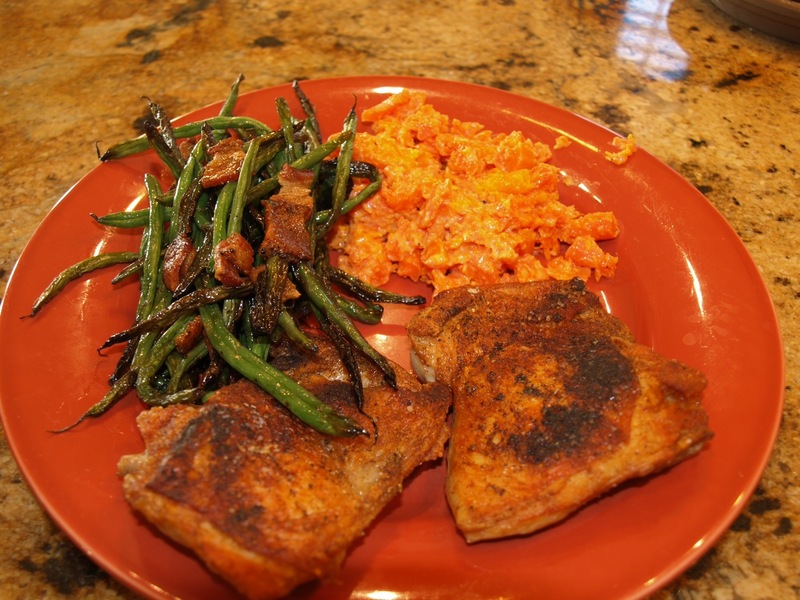 In fact, one of my 4 Keys to Paleo Success is cooking at home! I have a wife, two hungry kids, and a full medical practice. I also happen to be the one and only cook in my home…so, I am always looking for ways to make easy and convenient food that my family enjoys. Some may say I have a bit of an obsession with kitchen equipment (especially my wife). That said, no matter how big your kitchen is you eventually run out of room to store things. So a couple of years ago when I started to look into Sous Vide technology to say that my wife was a little cold on the idea would be an understatement. She was convinced that this would be another high dollar toy to collect dust in the pantry (I would like to say, there are none of those to speak of…:). After several years, my Sous Vide is still going strong, and even my wife has admitted to me that it was probably the most useful appliance we have ever bought to cook with! Now that’s saying something. I use my sous vide so much that it has a permanent place on our kitchen counter because it is pretty much always on! If you have ever uttered the words “I just don’t have time to cook”, the sous vide could be the answer you have been looking for. When I mention the sous vide to others they are usually intrigued and completely in the dark about the technology. That’s why I decided why not do a blog post on it and see if we can get more people perfectly cooking meals at home! 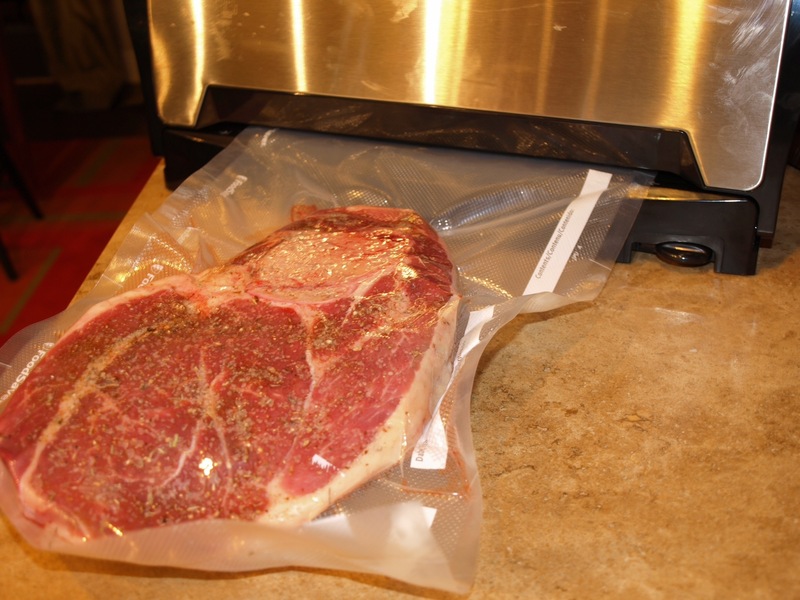 The Concept: Sous Vide is French for “Under Vacuum.” This method of cooking uses a precisely controlled water bath to cook food that is vacuum sealed in airtight plastic bags. To do it you need a vacuum seal device like your typical Food Saver, and a way to precisely control a water bath’s temperature. By cooking food in this way you assure that the food is always cooked to the precise temperature that you would like, and you never have to worry about ruining that expensive piece of meat you bought! In the end it is a very simple concept: cook food to precisely the right temperature to get optimum results (oh, and it can’t be any easier to do). 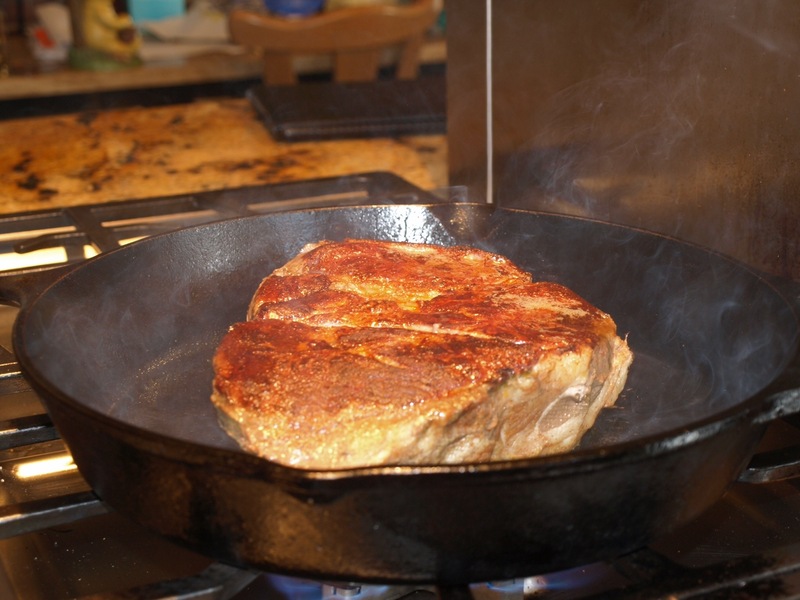 All you do is decide on what you want to cook, soak it at the appropriate temperature for an adequate amount of time, and finish it off with a quick sear to achieve the crispy brown exterior that adds so much to the flavor of meat. Now the science behind sous vide cooking is extensive, and can be very complex, but you can keep it pretty simple by experimenting with cooking times on your own and never rushing the process. Check out this page at SousVideSupreme.com for specific cooking times, or totally geek out with the Sous Vide Dash mobile app to better control your cooking times! The most important thing to remember is my opinion is to adequately season your food before vacuum sealing AND before searing. This leads to the most consistent results and great flavor. In addition, don’t forget to thoroughly DRY off your meat prior to searing or you just won’t get the amazing results your food deserves. The Cost: You can spend thousands on amazing sous vide systems, but unless you are commercial chef there is absolutely no need. I use the Sous Vide Supreme Demi that I paid $329 on Amazon for (you can spend an extra $100 for the slightly larger standard side Supreme). I also bought a Food Saver vacuum machine from Sam’s Club for around $130, and I was ready to go. Is this equipment cheap? Absolutely not! Is it worth it, I would have to say every penny. Sous Vide Supreme has a home on my countertop. 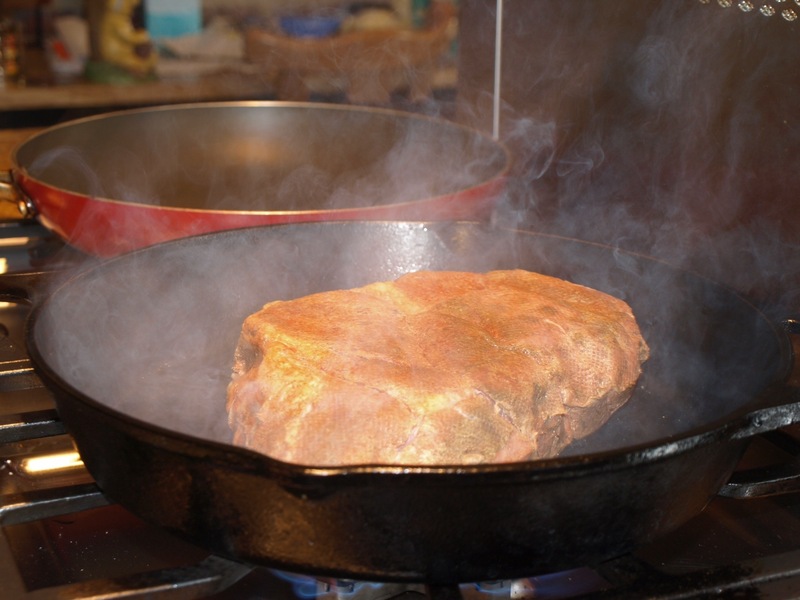 The Convenience: Most large pieces of meat take hours to cook in the oven, and the results are often variable. 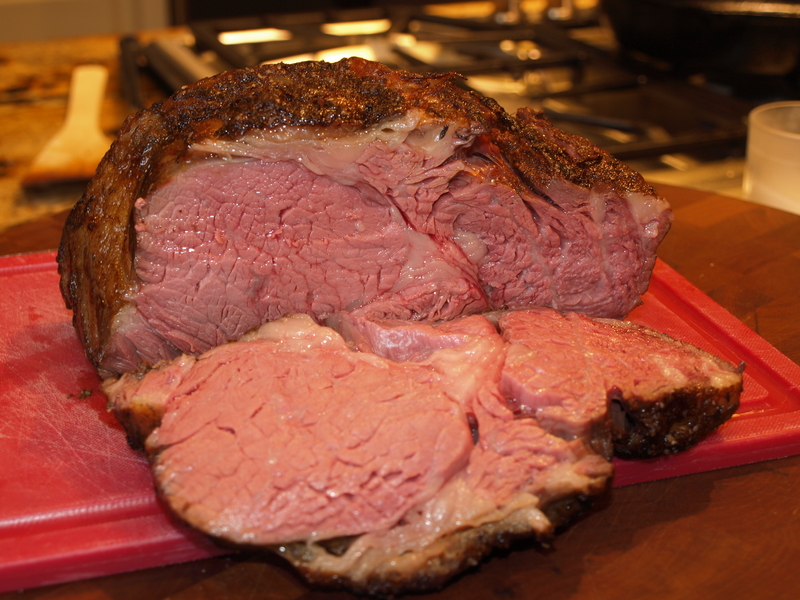 You cook a Ribeye roast and the outer parts are overcooked while the interior can be a bit raw. A very expensive piece of meat normally turns out good, but why risk it and instead always make it great! 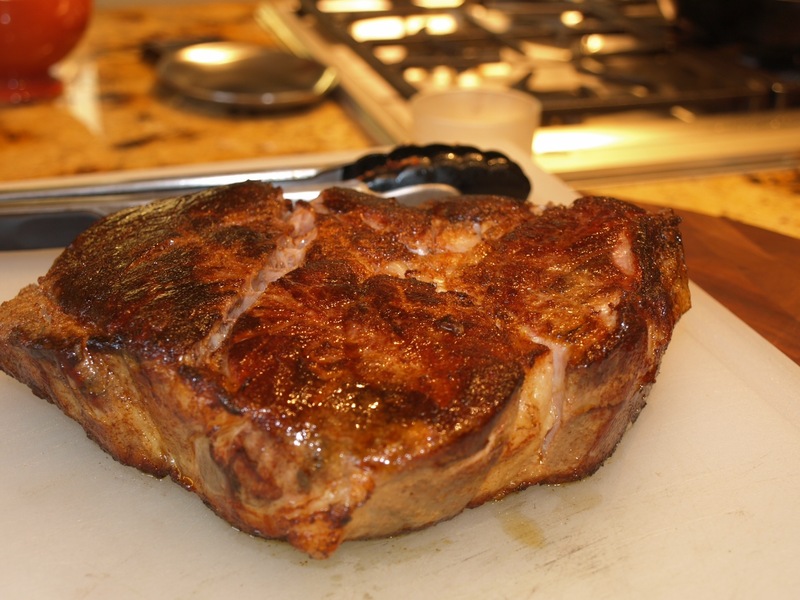 Lets say you have a 4 pound Ribeye roast and you want to cook it perfectly rare/medium rare. Hands on time includes getting it out of its packaging and seasoning it. Next you place it in a Food Saver bag and seal it. So far, total time, maybe two minutes. 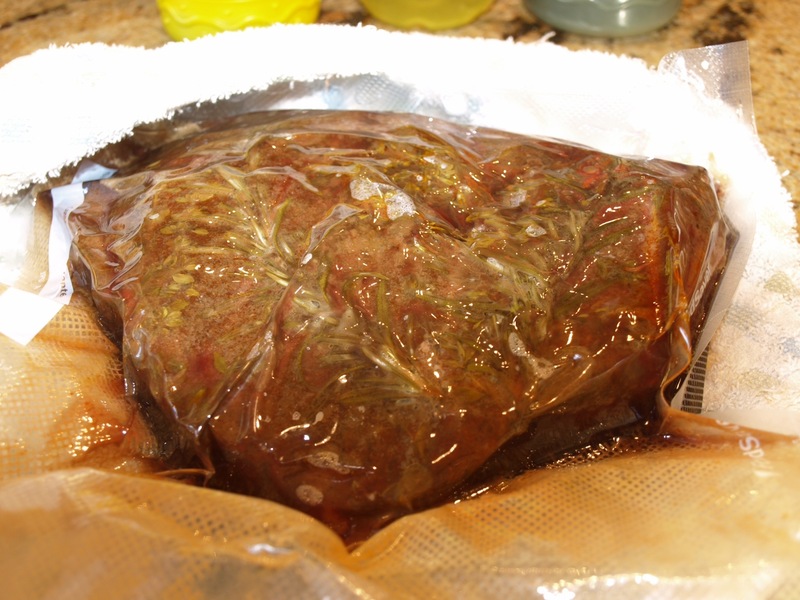 Get your Sous Vide out, fill it with water, set it to your desired temperature (I prefer 130F for beef), and place your roast inside. 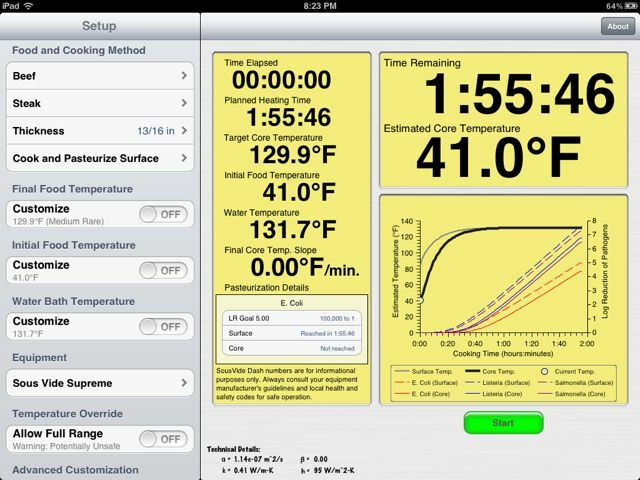 Using a chart or the mobile app you can easily determine the minimum time needed to cook your roast. The key is that you find out the MINIMUM time, but that is not a MAXIMUM time! 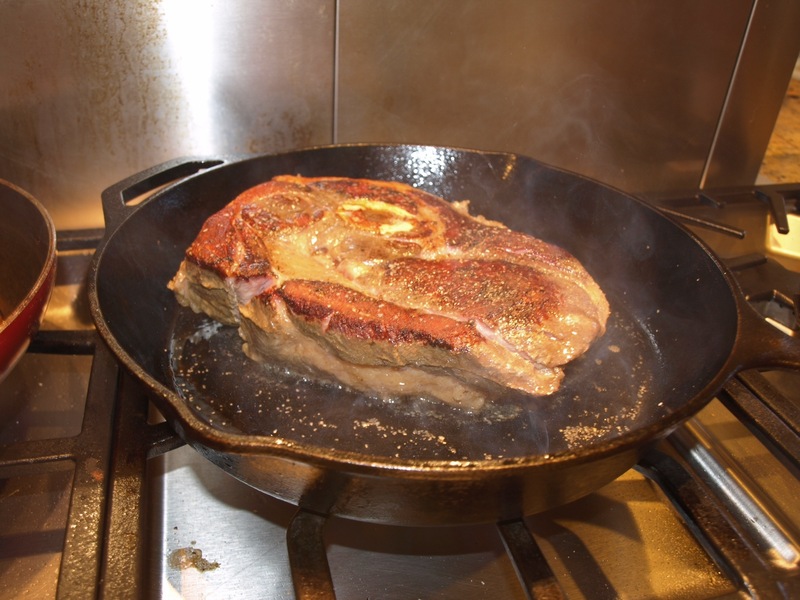 You cannot overcook your meat, as it will never go above 130F no matter how long it sits in the water. Let’s say it takes 5 hours to cook, you can leave it 8-9 hours until you get home from work without any issue whatsoever. 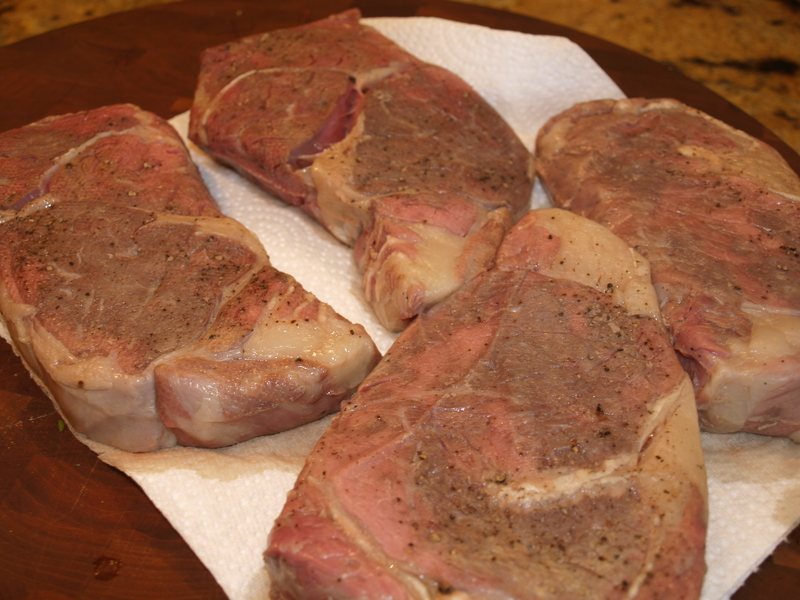 In fact, with tougher cuts of meat I often cook them for 24-72 hours. I’m sure you can keep meat in too long and it will mess with the texture, but I have yet to have any major issues with that. The key is that under most circumstances, the meat can wait for YOU to be ready to finish it off, not vice versa. Once I get home I put a cast iron skillet on full blast gas to heat up while I take the roast out of the bag and thoroughly dry it. I add a little more seasoning and brown it on each side in a little coconut oil for 30-45 seconds. Total hands on time for the roast 10 minutes MAX, and the results are perfect. This convenience aspect is why we love the sous vide so much. The main part of our dinner many nights is perfectly cooked animal based protein, and the sous vide makes it amazingly easy to prepare with very little time invested. I have cooked countless cuts of meat this way, and I am yet to have a problem with the results. 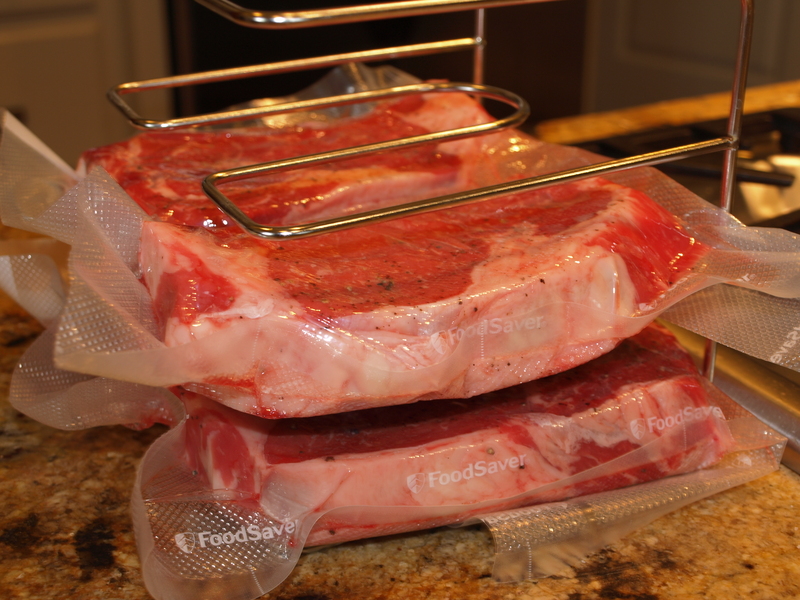 Here are two more things to keep in mind when it comes to the convenience of sous vide cooking. Lets say you find a good deal and want to buy some meat in bulk…you are likely going to freeze some of your bounty. 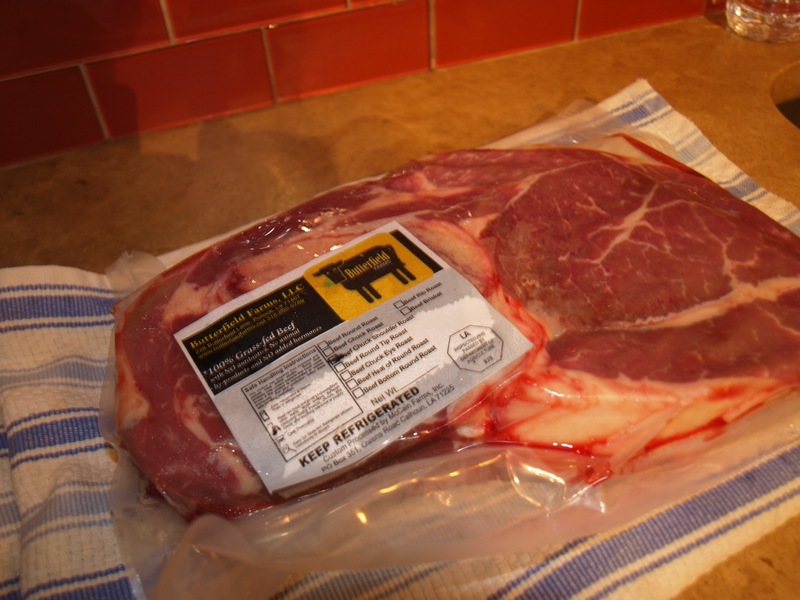 Simply season the meat, vacuum seal it, label it, and stuff it in the freezer. 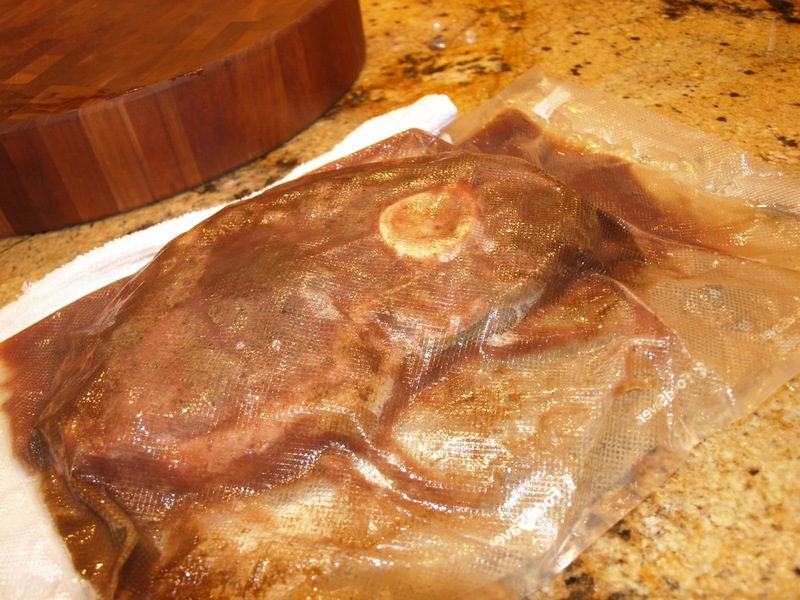 When it comes time to cook your meat no need to defrost it, simply stick it into the sous vide at the right temperature frozen, and add an hour or so to the cooking time. Perfect meat, straight from the freezer, and no time consuming defrost! Lastly, how many of you have had this happen? 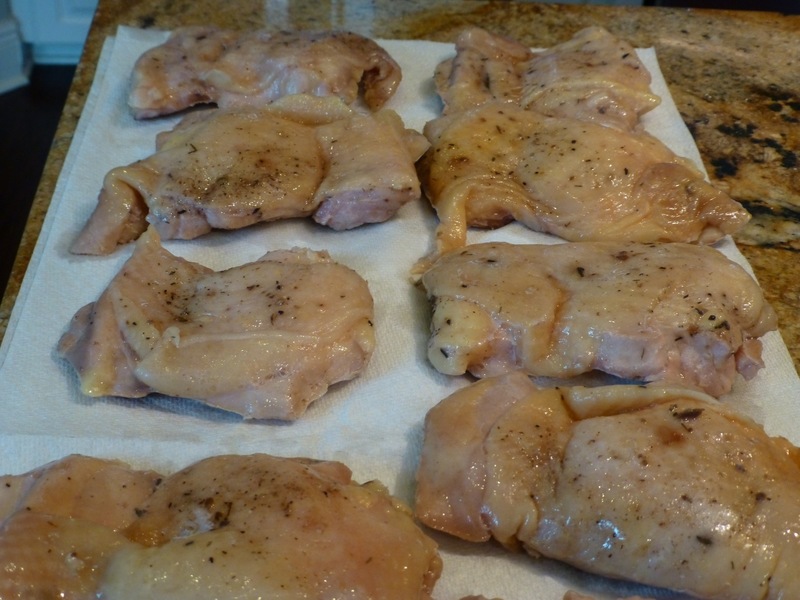 You plan to make chicken thighs for dinner and they are soaking away in the sous vide. For whatever reason you end up staying out later than you want, the kids get hungry, and you take them to a local eatery for dinner to less complicate your life. What to do with the thighs? When you get home take them out of the sous vide and dunk them in a cold water bath. Once completely cooled place them, bag and all, into your fridge. In the next day or two simply pop them back into the pre-heated sous vide for an hour to heat them through and proceed with dinner as usual! I have even frozen completely cooked sous vide meat as an experiment and reheated it straight from the freezer. 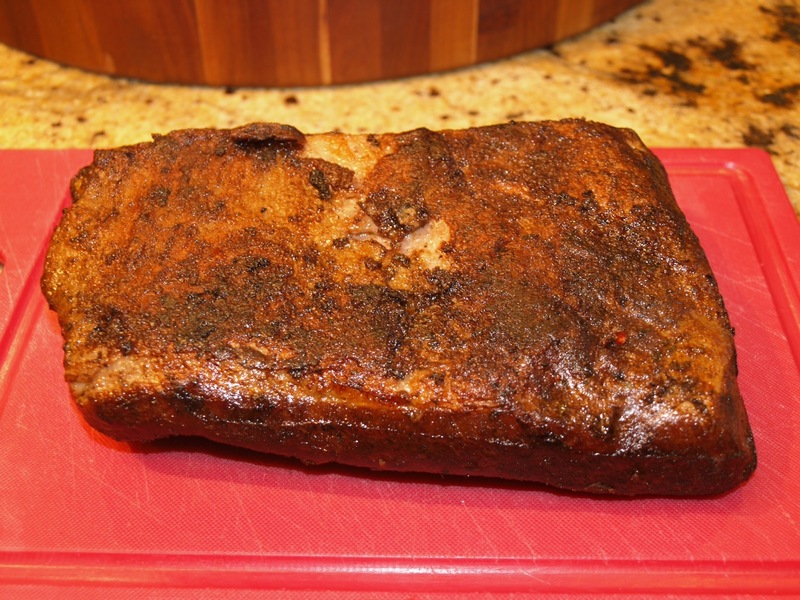 Meat was perfect…you just can’t seem to go wrong. The Consistency: I can’t tell you how nice it is to know that what I cook will be perfectly cooked to my family’s liking every single time. As many of you we spend the time to source our meat locally and make sure it is raised in a healthy and responsible manner. Those of you who do the same no doubt know that this meat does come at a cost. Nothing aggravates me more than taking an expensive piece of meat and not having it come out just right…or even worse, totally killing it! That simply does not happen with the Sous Vide. It’s 100% guaranteed to be perfect if you can just set the temperature right and cook it long enough. This consistency also leads to enjoying meat at it’s best. While beef is often cooked rare and enjoyed that way (my 7 year old daughter recently sent a steak back at a restaurant because it was medium…much to done for her! 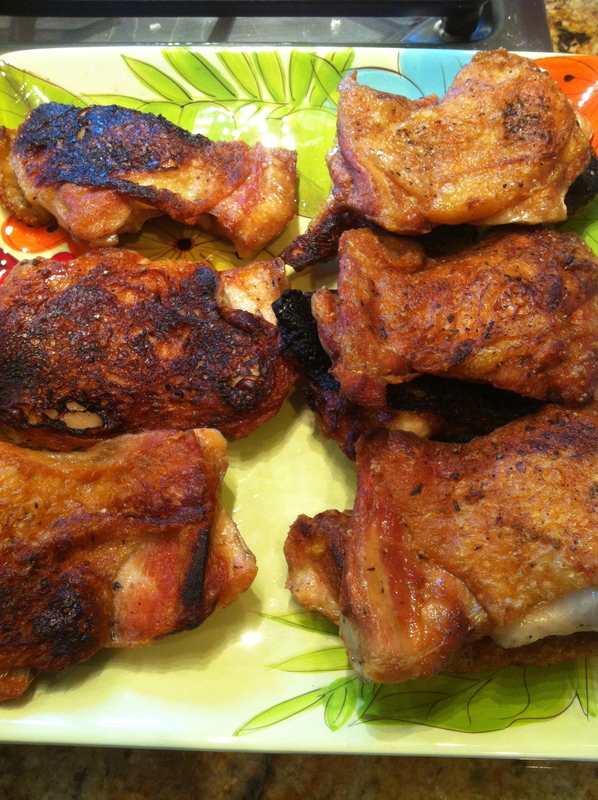 ), other meats in particular pork are often overcooked for fear of food borne illness. When you calculate the time to cook meats you can calculate the time for the core of your meat to reach a certain temperature, or you can calculate the time to Pasteurize the meat to the core. That means you can cook a pork tenderloin or roast to medium long enough to kill any potential bacteria, and finally be able to enjoy amazingly juicy pork! I had honestly given up on pork tenderloin as it always turned out too dry for my liking no matter what I did! The sous vide has brought all pork back to my kitchen, and I am amazed at what I was missing with poor temperature control! The Versatility: To say you can cook anything in the Sous Vide is not an over-statement. I have cooked just about every type of animal and cut of animal out there, and I have gotten amazing results. Want to cook seafood? Go for it. Veggies? Have at it. You can even cook eggs in a sous vide! The Results: If you have not figured it out yet, the Sous Vide has led to some of the most amazing meat dishes I have every made, with little to no energy expended on my part. I never have to worry about how dinner will turn out. 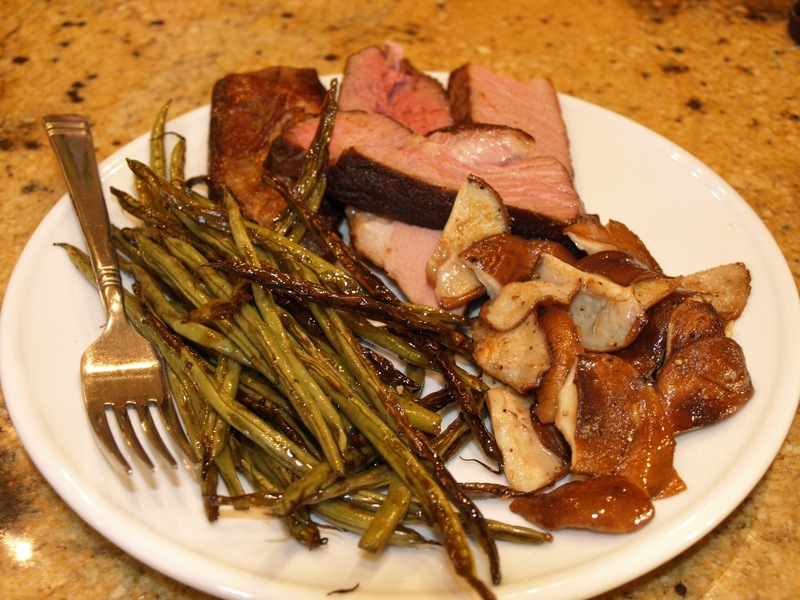 Here are some examples of dinners from my Sous Vide Supreme. Sealed and ready for a dip! I hope this has given you even a little bit of interest in Sous Vide cooking! There is no doubt that the cost of the equipment to cook this way can be hard to afford. All I can tell you is that I have owned my fair share of kitchen equipment in my day, and I would be hard pressed to find a more valuable member of my cooking arsenal than my fancy water bath. Have experience with a Sous Vide of your own? Share your experiences and new ideas on what to throw in and at what temperature! Here are some useful links for Sous Vide cooking! 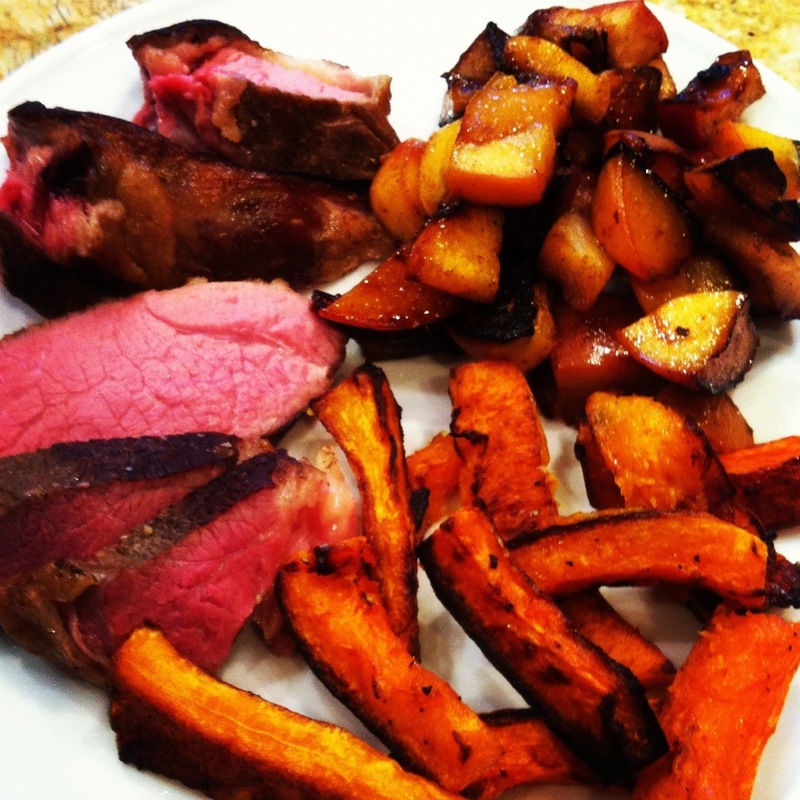 Nom Nom Paleo – Amazing food blog that first peaked my interest in Sous Vide Cooking. I really can’t tell you guys enough how much you need to check out Michelle’s blog. It’s beautiful, witty, and delicious! Check out her recipes and her iPad app that includes many recipes specific to Sous Vide. The chicken thigh recipe above? All Nom Nom! 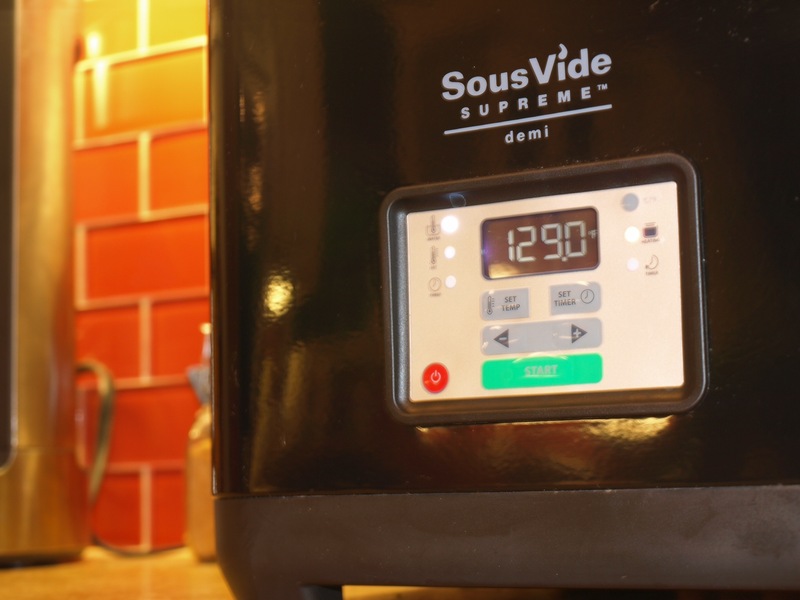 Sous Vide Supreme – Makers of what I think are the most affordable and easy to use Sous Vide cookers for the home cook. 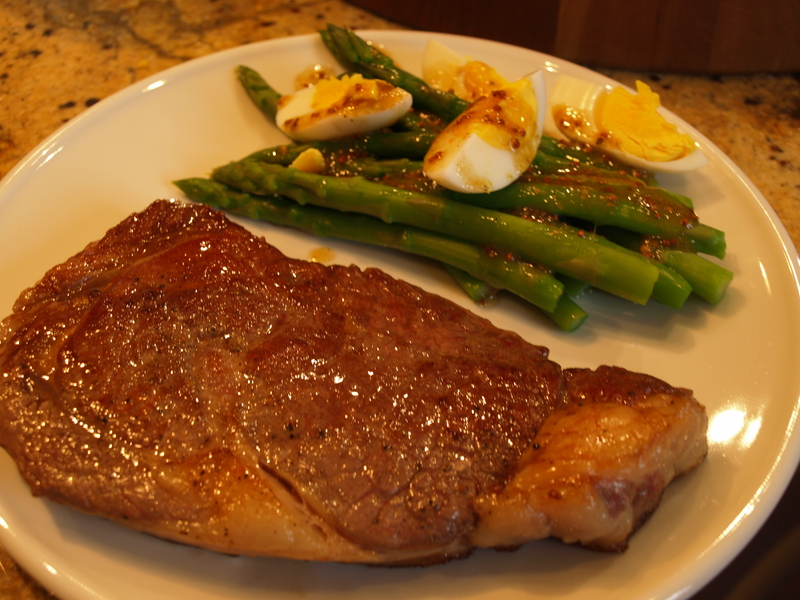 Sous Vide Cooking – A Blog all about Sous Vide Cooking! Another busy day down, and another day of my Whole 30 in the books. What is becoming too much of a common theme around here is me running out of the house early to get through my hospital work before my clinic. Today was no exception, and I grabbed a few scrambled eggs on the way out the door. For lunch I met a few buddies at a local eatery where a lot of the Paleo crowd tends to hang out. I got an awesome Ribeye, grilled veggies, and a baked sweet potato. Talk about hitting the spot! Dinner started last night when I got a grassfed shoulder tip roast from Butterfield Farms and seasoned it well with salt, paprika, and garlic powder. 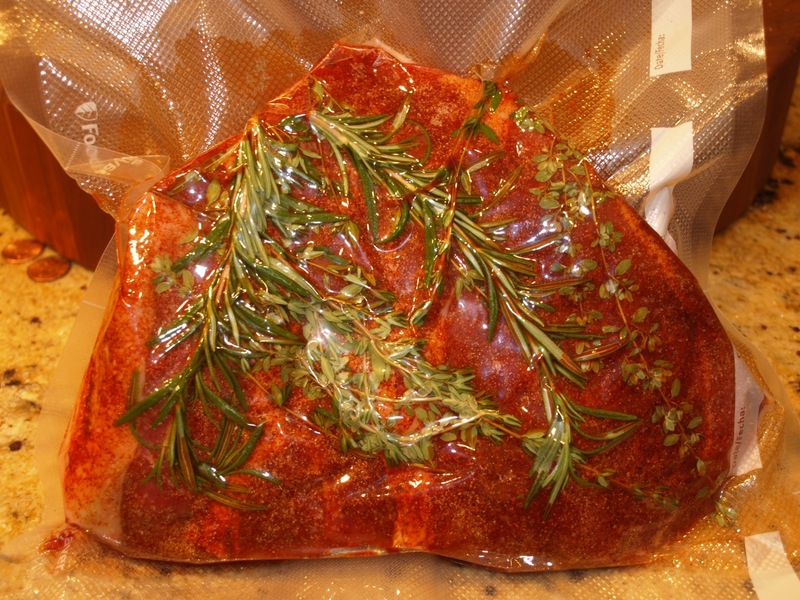 I vacuum sealed it with a generous amount of fresh thyme and rosemary sprigs from the herb garden. Next I filled my Sous Vide Supreme with water and set the temp to 131 F.
I put the roast into the sous vide and let it soak until tonight, right at 24 hours total. 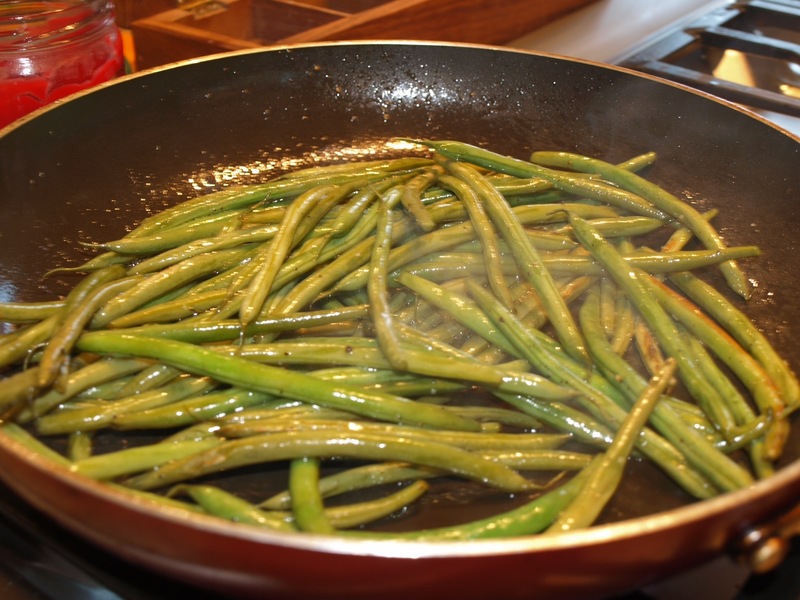 Before finishing off the meat I quickly steamed some green beans for just a few minutes to knock the rawness off, and then sautéed them over very high heat in some coconut oil. I kept a close eye on them because I wanted to get a really good char on them to bring out the best flavor. 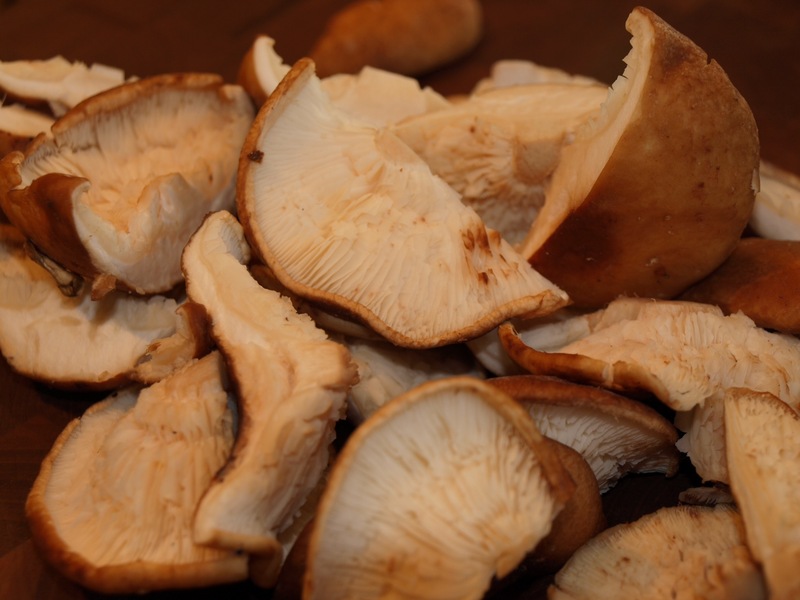 Next I stemmed and halved some beautiful looking shitake mushrooms and quickly sautéed them in some olive oil. With the side dishes waiting, I turned my attention back to the beef. I set my cast iron skillet on high heat and let it pre-heat for at least 5 minutes. I removed the beef from the bag and dried it off really well. I had to literally peel the herbs off of it, and the smell was amazing. I put some coconut oil in the skillet and put the roast in. Around 3 minutes later, NEVER moving the meat, I flipped it over for another 3 minutes. Lastly I quickly seared the edges of the meat and it was time to plate! Another night down! Tomorrow starts probably the hardest part of my Whole 30…we leave on our week long vacation with the kids to the Smokey Mountains. Despite that, nothing can damper my excitement of getting on the road with the kids and my wife and enjoying some quality time together. I’m not sure how consistent I’ll be blogging during vacation, but I will try my best to keep things moving along and document as much as I can. My plan is to continue to publish nightly during my Whole 30, so we’ll see how that goes! One last picture of my dinner plate tonight and I’m calling it a night! Today I stand at the verge of hitting double digits in my 30 day challenge! Tomorrow will be 1/3 down, and I’m pretty excited about it. I was off today which was nice. I started the day doing some home visits for a hospice that I work for. It’s not often we get out in patient’s homes these days, so the visits have become quite enjoyable for me even though it is my day off! This morning I made a two egg omelette for breakfast with my super fresh farm eggs. Yum! My wife and I had the rare chance to grab some lunch today sans kids and we headed to a local burger joint and ate amazing burgers minus the buns of course. Some sweet potato on the side and we were stuffed! Dinner tonight actually started two days ago when I defrosted a beef chuck shoulder roast from Butterfield Farms and vacuum packed it after lightly seasoning it. I prepared my Sous Vide Supreme and warmed the water to 130 F. Using my newly purchased metal rack I put the roast in, and let the magic happen for 48 hours…till tonight. I got the roast out and this is what I found! 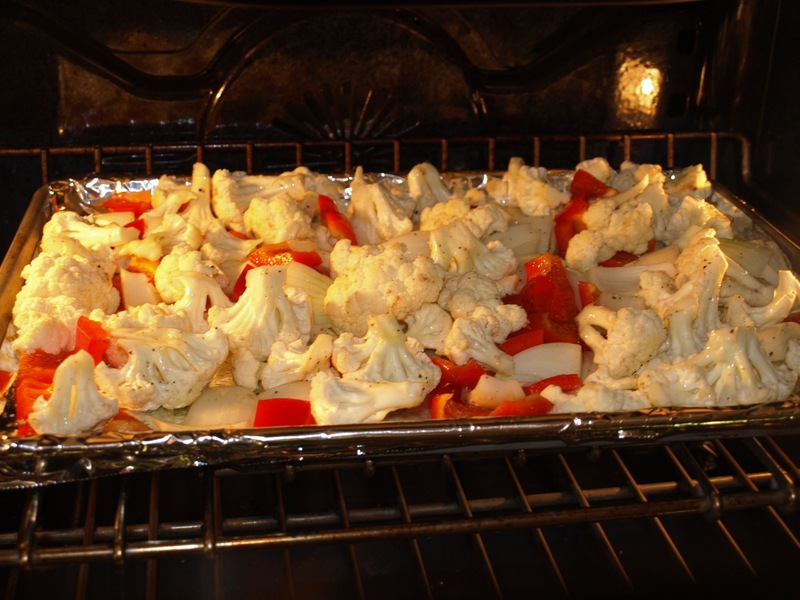 In the mean time I chopped up a red pepper, yellow onion, and a head of cauliflower and cranked up the convection oven to 385F. 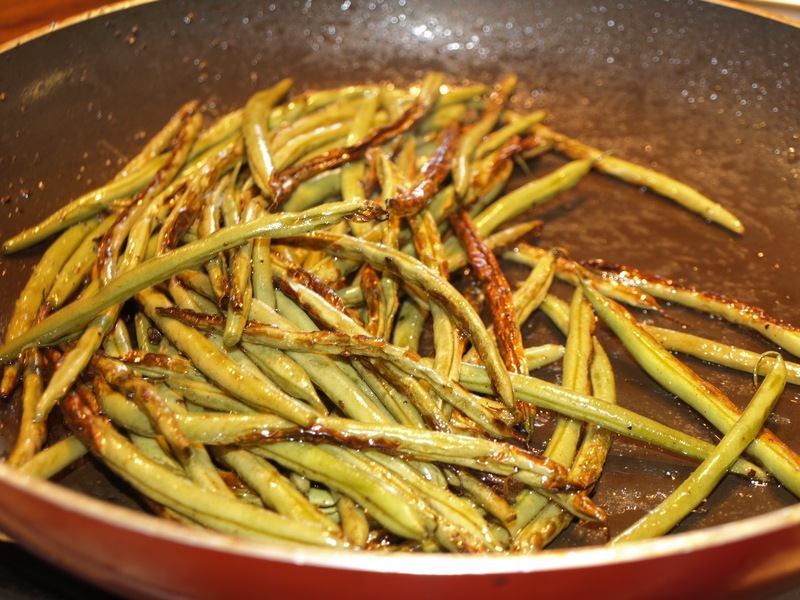 I tossed them with olive oil, salt, and pepper and cooked them for around 40 minutes shaking them around every 10 minutes or so. I removed the roast from the bag and dried it thoroughly. Using my Iwatani Butane torch I browned it nicely all over. 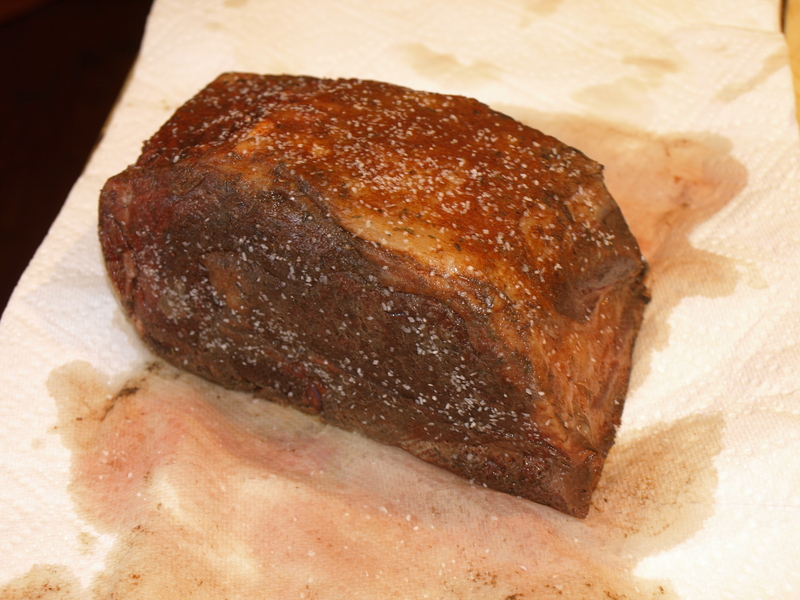 As you can see the meat was perfectly cooked edge to edge…Sous Vide style! The taste of the grass fed beef is definitely different, but we all agree better. 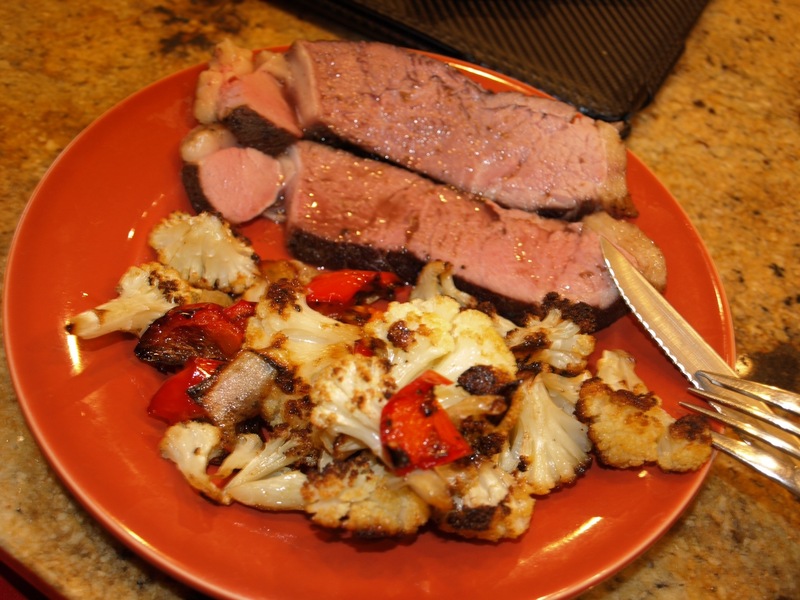 My daughter (6 years old) inhaled around a third of the darn roast and declared…”Dad, grass fed is the way to go!” This chuck roast was transformed into meat comparable in taste and texture to prime rib. Cheap cut + warm tub + time = Expensive cut results! The best way I can describe the difference in taste is to say that the grass fed beef tastes like a dry aged steak at a steak house. It must be the grass coming through, but it was very enjoyable. Here is what the end result looked like. All in all, a very good day off. I really want to encourage anyone out there who is even considering a Sous Vide purchase to do it! I bought the Demi version which reportedly has 85% of the cooking area as the more expensive regular sized unit. The cost of $299 is worth every penny. I do not consider this a kitchen gadget, or fluffy luxury, it is an integral part of my cooking equipment on a day to day basis. Even my wife, the “expensive kitchen gadget we don’t need” queen has admitted that I was…wait for it…”right” about how awesome this thing would be. She is even trying to convince her friends to buy one! If you are serious about Paleo and spend the money on Grass fed meat and wild caught seafood you DON’T want to waste your money and improperly cook things. The Sous Vide is like a guarantee that your investment will be worth it. I hope all had a wonderful day. I will continue to keep posting about my Whole 30 experience, and plan on continuing to share my insights as a Paleo Physician in a very non-Paleo world. I appreciate everyone who follows, comments, and supports my blog. May you all have a blessed evening. Another day down, and all is well! Breakfast consisted of a handful of nuts as I ran out the door. Went out to lunch with my wife and kids and I ordered a diet coke as usual. My wife looked kind of funny at me and asked if I realized I had ordered one! I had to send it back and get my water…total habit! For lunch I had some chicken and a side of fruit. For dinner tonight I was excited to try out the first of our grassfed beef shipment we got in yesterday! I decided to go simple and cooked up some hamburger steaks. 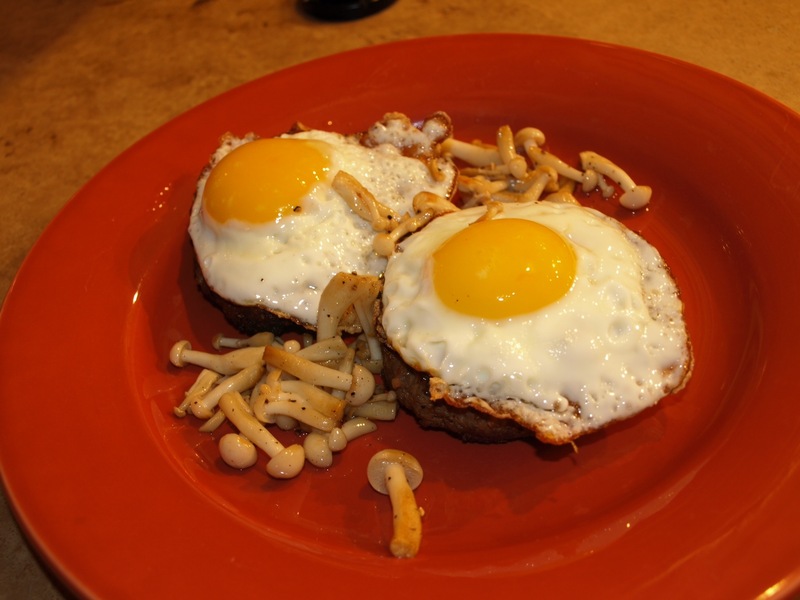 To complete the Umami fest I fried up some freerange eggs I also picked up from Butterfield Farms along with some enoki mushrooms from the store. Man…talk about good! Big day tomorrow…I teach my first Sunday School Lesson at church…wish me luck! Day 5 is done! Finally had a pretty relaxed day at work and was able to work on some things at the house. We’ll start with the food happenings of the day, which were pretty basic. Breakfast consisted of a few slices of roast beef and an egg. I had to rush through lunch, and had enough time to hit the grocery by my office for some strawberries, and avocado, and some left over chicken from the house. 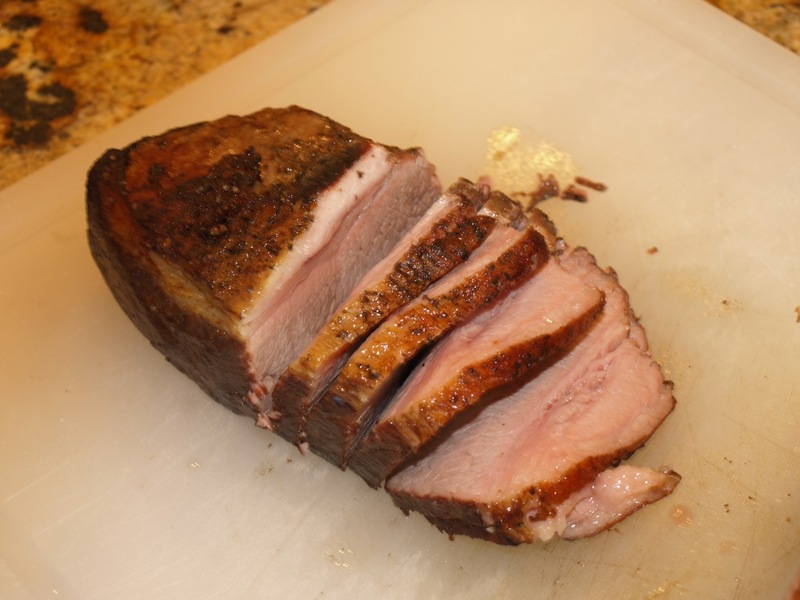 We had some dear friends over for dinner and I cooked up an awesome sous vide pork loin that was amazingly tender. 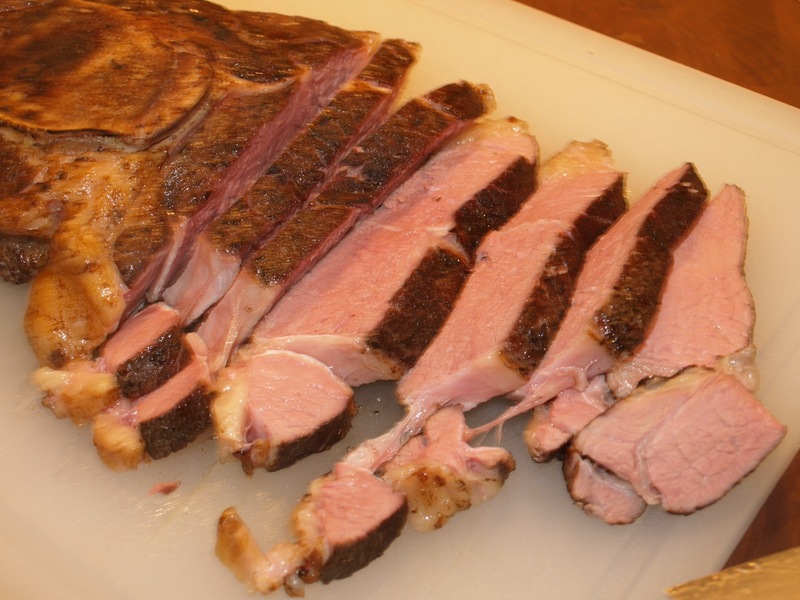 It’s so nice to be able to enjoy the pork medium/medium rare while knowing it is safe by cooking it long enough in the sous vide to pasteurize it! 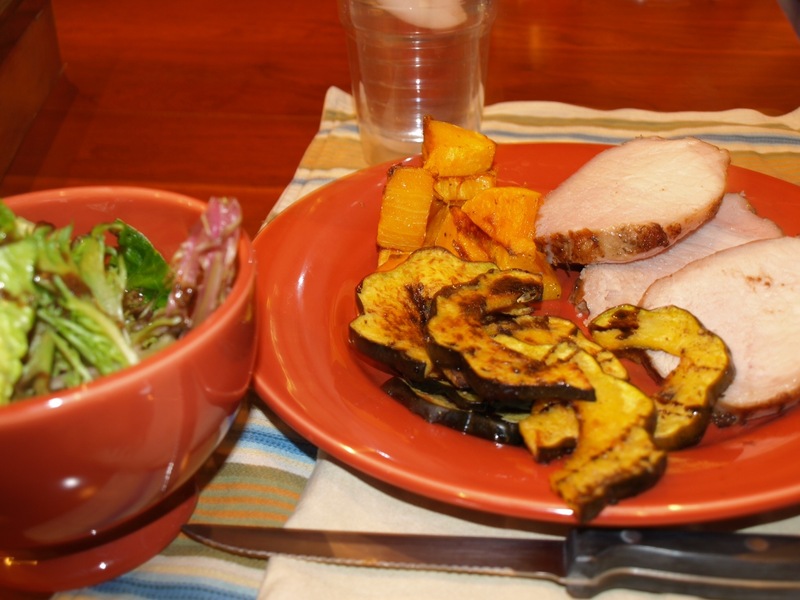 On the side I roasted up both a butternut squash and an acorn squash. Good food and good fun was shared all around. The other exciting happening of the day was picking up our first order of grassfed beef from our new friends John and Tina Butterfield at their family run Butterfield Farms in Pollack, LA. 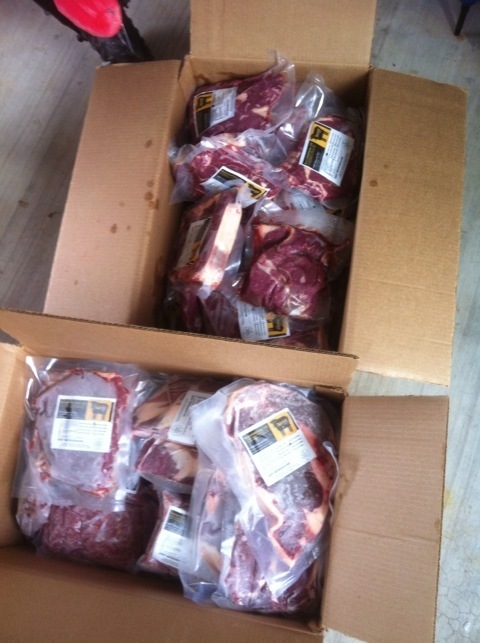 We ordered one share of beef which equals 1/4 of the cow, coming in at just under 80 pounds. I was like a kid in a candy store moving individual vacuum packed cuts from the boxes into our freezer. The variety in the cuts was exciting, and I can’t wait to cook some up tomorrow for our first try. I’m thinking I may go simple with hamburger patties topped with some farm fresh Butterfield Farms fried eggs! I’ll be sure to post some pictures of what I come up with.